Christmas break would be a whole lot more relaxing if the kids still had school, amirite? Once the wrapping paper is swept away and it's back to (funny) business as usual, what are we going to do with the kids over break? Here are a few ideas, including one that's open on Christmas! But first, enter our MAM pacifier giveaway! The winner will receive a MAM prize pack worth $30! We'll be accepting entries until December 24. Both Westchester locations have special hours over the next week. Click here for more info. This gym and preschool in Chappaqua is having both special camp days for older kids and Open Romperee hours for for kids 0 to 4 from 12/27 to 12/29. Click here for more info. This festival in Valhalla is open starting at 5pm from Tuesday to the 31st. Click here for more info. This is my go to for a low-key good time. Not only is there Billy Beez (which might be insane this week, so you may want to steer clear), but there's Palisades Climb, which has a small 3-foot-high course for kids as young as two, and who doesn't love an indoor ferris wheel and merry go round? If you have older kids there are attractions like movies, ice skating, bowling, escape and puzzle rooms, a VR store, and an indoor speedway. Plus, their Barnes & Noble has a train table (for some parents this is a very big deal). And for moms they have the ultimate attraction: Target! Click here for more info. 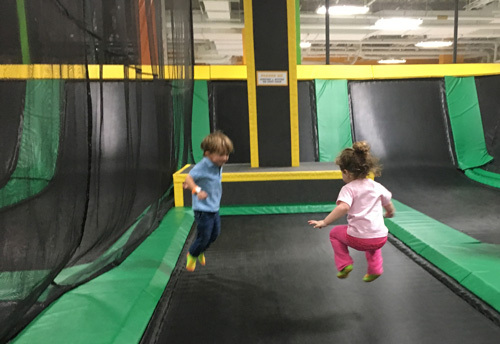 You've probably been to at least one birthday party at this Elmsford inflatable activity center, but did you know they also have open bounce times and special events? Their calendar has a ton of bounce opportunities, including a New Year's themed bounce with an early countdown for those of us who can't stay up past bedtime to watch the ball drop. Click here for more info. While our Weekly Library Programs chart might not be so useful on vacation week, you can check with your local library to see what they are up to in the next few days. We checked Crestwood Library in Yonkers and they have a movie on Tuesday, Dance with Daphne on Wednesday, Decorate a Candle on Thursday, and Fit & Fun Friday. And that's just one library branch! Some of these require registration, so click here for more info. 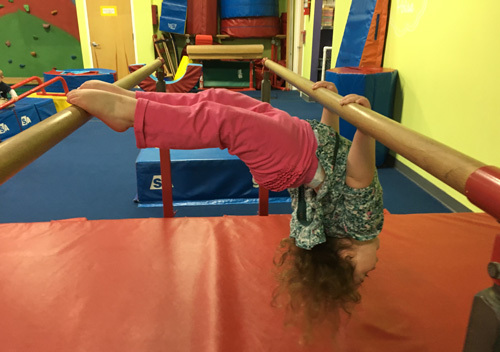 This Scarsdale kiddie gym has camp days over the break. 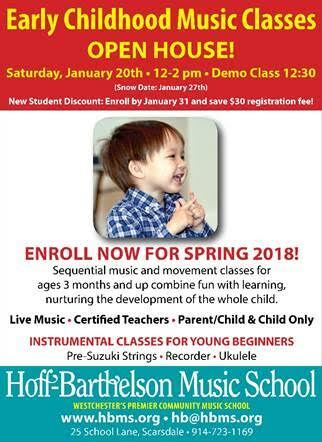 You can do a half day or full day, and kids as young as 2 can participate. They don't have to be potty trained! Click here for more info. They are open 365 days a year! So if you need a diversion this Christmas, head to Ridge Hill and play between 10am and 7pm (last admission is at 5pm). Right now they are having a Holiday Bricktacular event with holiday-themed builds and a scavenger hunt. Children under 2 are always free. Click here for more info. If your house is trashed from Christmas and you need a place to meet up for a play date, this is your jam. Always clean with kid-approved toys to play with and a comfy couch for you, they're open over the break. Don't have a play date in the works? There are events every day: Free story time on Wednesday, free coloring on Thursday, a dance party with snacks for $5 on Thursday, and a puppet show on Saturday. Click here for more info. Bonus: 8 days of free baby gym in January! Did everyone hear that My Gym is opening in Dobbs Ferry? They are celebrating with 8 days of free programming between January 12 and the 21st. And if you sign up between now and the 11th they have an opening special. Call 914-591-5437 and mention BabyGotChat for more info. I hope this list leaves you with lots of fun over the break! Have a great break! The best Christmas gift I could get is for you to follow us on Facebook and Instagram.